Hat tip goes to reader David for providing the above chart, which was created by Pension Partners. 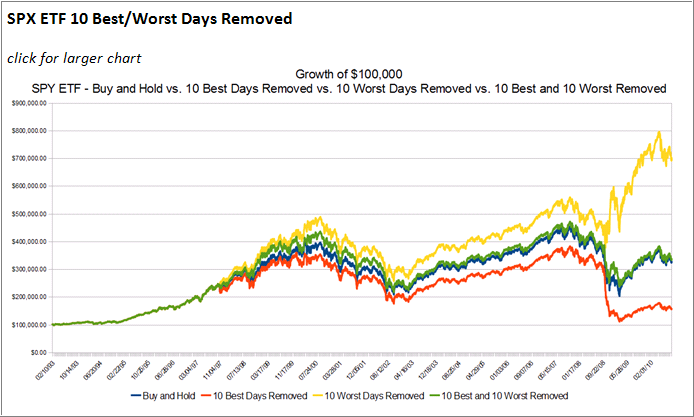 • The 10 best days account for 50% of the buy and hold performance (roughly 0.2% of the days from 1993 to August 2010). The lesson I take from this: It is great if you can avoid the major down days, but only if you can do so in a way that does not have you missing the major up days. If you manage to avoid all of the Worst days, but miss all of the Best days too, then your portfolio performance will be is nearly the same as straight Buy & Hold (but with additional taxes and commissions paid). Now the reality is no one will consistently miss all the worst days — I’m the first guy to admit our 100% Cash call the day before the flash crash was dumb luck — but you can avoid being long for most of a secular bear market. If you can miss the longer downtrends, you end up way ahead. Not drops that last days or weeks, but the secular months and quarters in the red. That might be more challenging approach to chart — but it’s worth exploring . . . It has always been my belief that avoiding the downside is far more important for long-term portfolio performance than to participate in every uptick the market throws at you. The above chart makes a good point in demonstrating that, unfortunately, only on a buy and hold basis. It would be interesting to see what the effect would be when used with the rules of trend tracking, where you automatically avoid the worst days in the market. At the same time, however, some of the best days in terms of rebound rallies may very well happen while in bear market territory; so you would miss those as well. 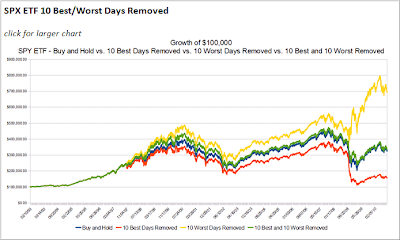 Since it is impossible to foresee when the best days or the worst days are about to happen, this analysis is pretty useless as an investment method. 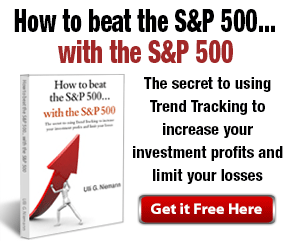 Trend Tracking on the other hand offers a viable alternative. Let’s look at our last domestic sell signal effective 6/23/08. The S&P; 500 stood at 1,318 and closed last Friday at 1,149. That means it still has to gain another 14.74% just to reach the breakeven point despite the sharp rallies off the March 09 lows. I am sure that during the period we were out of the market (6/23/08 to 6/3/09) we saw some of the worst days and some of the very best ones. The key, however, was to be out altogether to avoid the market meltdown, which makes it unimportant as to whether we participated in the best recovery days or not.